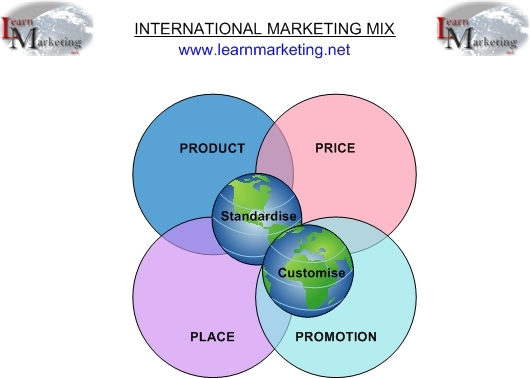 For international markets, pricing is one of the most important elements of marketing product mix, generates cash and determines a company’s survival. This blog post sheds light on international pricing strategies in a global marketing environment. Pricing, as part of the marketing mix, is essential and has been always one of the most difficult decisions in marketing because of increased competition, counterfeit activities, regional trading blocks and volatile exchange rates. Consumers have different perception of the products depending on the price. Therefore, pricing products for consumers is a difficult task, mainly because a high price may cause negative feelings about products, and also a low price can be misleading on other products features such as quality. There are many pricing objectives that lead to different strategies. Some of the ways of pricing a product is: premium and penetration pricing, price skimming, economy and psychological pricing, product bundle pricing etc. However, the situation is further complicated when it comes to pricing for international and global markets. Setting prices for international markets is not an easy task. Decisions with regards to product, price, and distribution for international markets are unique to each country. Furthermore, other factors such as: the ROI, market stabilization, demand and competition-led pricing, market penetration, early cash recovery, company and product factors, market and environmental factors, as well as economic, political, social and cultural factors, have to be considered in the decision-making process. This Blog post examine factors that affect pricing decision making process for international/global marketing environment as a consumer behavior variable. 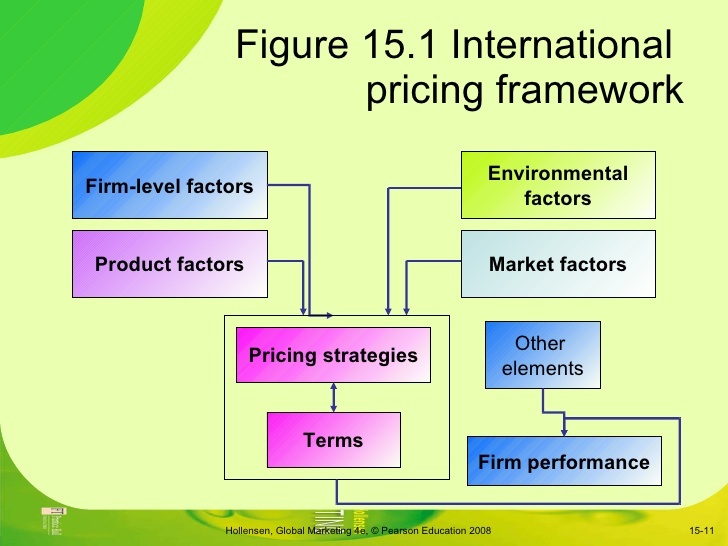 Pricing for international markets involves other factors related to foreign customer behaviors such as: economic and political aspect of target market, education and technological, values and attitudes, social and cultural, language, religion and beliefs, legal as well as competitive factors to mention a few. Products have to be distributed through the most appropriate channels and priced according to local market environment conditions. Local market conditions may be different and companies have to adapt to the needs of local customers. The PEST (Political, Economic, Social, Technological) factors have been used to analyze foreign market opportunities. Environmental monitoring should continue throughout the business cycle. Since marketers must comply with the law, an understanding of governmental policy and the process by which it is created is central to effective marketing decision-making. To operate, international firms must understand the policy-making process and different categories of laws, and marketers must also investigate the general policy climate and local laws that affect the operation of their business. The main objective of marketing strategy is pivotal to customer satisfaction, financial performance, and compliance. Pricing is influenced by laws and regulations which necessitate product modifications, in compliance with health and safety standards, environmental regulations, measures systems etc. Government policies influence the legislative and economic frameworks. Perhaps the most sinister cloud from the political arena is the threat of wars. The level of GDP is the main measure of economic attractiveness of foreign markets. As GDP increases, the demand for goods and services increases too. Furthermore, marketers consider the distribution of income within a country, in order to identify niche and segment markets. Marketers always watch not only the present economic prosperity of a country, but also its future development in terms of population and density, inflation and economic growth, age and distribution of income, level of urbanization as well as other economic activities that will affect markets and pricing. The economic environment of the foreign or host country influences pricing decisions. It has a significant impact on firm’s costs, determines demand potential for a particular product/service, in addition to the prices that local customers can afford and are willing to pay. For example, some products that are considered essential in western countries, are viewed as luxury items in my country (India), and most of the Asian countries. People from different cultures have different tastes, buy different products and respond in different ways to the same service or product. Therefore, the demographic structure of a foreign market should be considered. The aging of population in major western markets, and the increase in population in several countries such as India and China, is another continuing development that will affect international marketing. As teens around the world are becoming a global market segment today, pricing strategies will have to adapt to social factors, that is, when pricing for international markets, one has to take into consideration of local material culture, language, aesthetics, education and religion, as well as attitudes and values. Firms/Markets need to examine carefully target market, country’s characteristics and purchasing behaviors, required to select appropriate pricing strategy. Price level is an important criterion used by consumers in evaluating competing products. Other criteria such as product quality and performance are important to customers. Thus, in developing pricing strategy, firms/organisations must be aware of foreign consumers’ preferences, perceptions, and purchasing behaviors with respect to various price levels. Firms/Organizations need to analyze the technological environment of foreign markets. Well-developed communication infrastructure is an important factor to respond rapidly to customer’s needs. International Firms/Organizations often rely on existing local distribution infrastructure in order to transport and distribute their products to consumers. This may have significant impact on costs, and in turn may influence price, as well as profits. Technological change is another dynamic but ongoing phenomenon. A perfect example is the internet. Internet allows online contact with the Firms/Organizations customers, suppliers, and partners and subsidiaries around the world, but it may also increase the opportunities for existing competitors and openings for new competitors. Therefore, technology provides both opportunities and challenges. Pricing is a strategic choice, and it will be partially influenced by environmental factors. Premium pricing is adopted when there is a substantial competitive advantage, and the product or service is unique (Concord flights), and economy pricing strategy is adopted when the cost of marketing and manufacture is kept at a minimum. Low profit margin will penetrate the market. It is designed to grab market share quickly. Penetrating the market with an exceptionally low-priced item creates a broad customer base. It also provides high value-for-the-dollar to the customer. Penetration is used when prices are set first low in order to attract new customers and to gain market share, and then the price is increased after the market share has been achieved. To penetrate the market and gain market share, international businesses set a low price in comparison to other competitors. Note that also low price is sometimes perceived as indication of low-quality product. It may also be difficult to increase price in the future without incurring loss. This is appropriate for some product to be priced as high as the market will bear. However, few buyers are attracted, and lower sales volumes can be achieved when price is such high. This strategy is often used when a new product is introduced into the market, and is in great demand. For this strategy, the product or service is charged high because of a substantial competitive advantage. This high price tends to attract new customers into the market, and then falls due to lower unit cost as economies of scale are achieved. Skimming is the opposite of penetration. The idea behind this pricing strategy is to return high profits, even at the cost of losing a large number of customers. Typically, when a company launches a new product, they charge higher prices in the beginning to help recoup R&D expenditures as fast as possible. To be successful, Firms/Organizations must have a unique product that’s in demand. For example, “chip manufacturers” often use this methodology during the introductory phase of a new proprietary product. Another aspect that closely resembles “skimming the cream,” is the high cost option. Companies like Mercedes-Benz or BMW are good examples. Customers purchase products from them knowing they probably paid too much. But these companies have the prestigious reputation of high-quality products and customer service. To attract the largest number of customers and generate consistent turnover, it may be necessary to set price not too high, not too low, just in line with other competitors. Prices are tagged to the competition and profits are acceptable. In the long run, no single pricing strategy will always work best, and producers should be prepared to adjust to any opportunities or threats that may arise in the ever-changing market. Even though premium pricing, penetration pricing, economy pricing, and price skimming are the main pricing strategies for marketing mix, there are other strategies to pricing such as: psychological pricing- product bundle pricing, marginal cost pricing strategies etc. In highly competitive markets, some companies may want to consider turning to marginal costing in order to ensure that their products are competitively priced. Marginal costing ignores the fixed cost incurred by companies, on the assumption that these costs will be incurred by domestic sales anyway and therefore, only variable costs need to be considered in pricing. Ignoring fixed costs will naturally reduce total costs, enabling lower prices to be set. Where possible, however, companies should not resort to this method of pricing. Value Bundling and Discounting Psychology plays an important role in the marketing world. It helps build the perception of price and value. The psychology of retail pricing is probably more important than the price itself. For example, the psychology of not using values ending in “0” or “1” in the price gives the customer the perception of saving. For example, $19.99 is viewed as a greater value over a product priced at an even $20. Logically, the customer knows the difference is not great. But there is still that sense of saving. Value Bundling gives the customer the feeling of getting something. For example, buy one, and get second free. Discounting also builds loyalty and encourages bulk purchases. Percentage off the normal retail price attracts customers and, the greater the discount, the happier the customer would be. Pricing is probably one of the toughest problems for a decision maker, when trying to price a product or service. It may include the cost of producing and providing the product, the profit that you need to make to stay in the business. Proper pricing takes into account costs, market demand and competition. In domestic markets, few companies are free to set prices without considering their competitors’ pricing policies. If a foreign market is serviced by many competitors, you may have little choice but to match the going price, or go below it, to win a share of the market. If your product or service is new to a market, you may, however, be able to set a higher price. Pricing in the international marketplace requires a shrewd of market strategy and companies need to define their pricing strategies, know their products, and understand host country’s environmental factors.